When most people think about St. Patrick's day they usually think about Boston, NY,NY Chicago or even New Orleans. 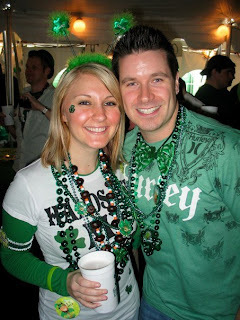 But Dayton Ohio has by far one of the most fun St. Patrick's days around. The last 2 years I have been out of town for St. Patrick's day. I was in Chicago 2 years ago and NY NY last year. I will have to say that the parade in NY is a sight to behold. Non-Stop bagpipe bands for a solid 3 hrs. If you have never heard a 100 piece or more piper band then you are definitely missing out on an incredible sound. Chicago was a good time but the sad thing was no one went all out with Green and costumes like they do in Dayton, OH. The green river was sweet and the pubs are wonderful. But there was no, one real place to hang and party. Everyone went into a small pub and pretty much stayed there. Unlike in Dayton where they set up huge party tents at pubs and have a huge party all day long. The vibe in NY for St. Patrick's day was pretty fun. Everyone was dressing up and having a great time just partying all day it seemed like.The pubs were hard to get into due to so many people partying. It was pretty cool it was like half the city was working and the other half was partying. 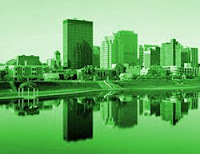 So now I'm back in Dayton this year for the celebration and looking forward to hanging out with all my friends this year and having a great St. Patrick's day in Dayton like no other place I have been to. Raise a Pint and listen to som pippers for tomorrow is St. Patrick's Day in Dayton, OH and I have never to been to a better party.... Yet! 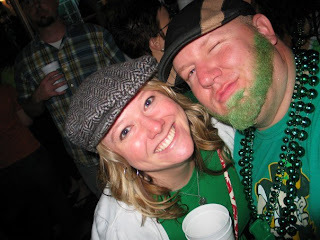 Two of my photos from St. Patricks day and a video.